A diaspora (from Greek διασπορά, "scattering, dispersion") is a scattered population whose origin lies within a smaller geographic locale. Diaspora can also refer to the movement of the population from its original homeland. Diaspora has come to refer particularly to historical mass dispersions of an involuntary nature, such as the expulsion of Jews from Judea, the fleeing of Greeks after the fall of Constantinople, the African Trans-Atlantic slave trade, the southern Chinese or Hindus of South Asia during the coolie trade, the Irish during and after the Irish Famine, the displacement of Palestinians in the 20th century, the exile and deportation of Circassians, and the emigration of Anglo-Saxon warriors and their families after the Norman Conquest of England, many of whom found employment in Constantinople and bolstered the elite bodyguard of the emperor, the Varangian Guard. Recently, scholars have distinguished between different kinds of diaspora, based on its causes such as imperialism, trade or labor migrations, or by the kind of social coherence within the diaspora community and its ties to the ancestral lands. Some diaspora communities maintain strong political ties with their homeland. Other qualities that may be typical of many diasporas are thoughts of return, relationships with other communities in the diaspora, and lack of full integration into the host country. The term is derived from the Greek verb διασπείρω (diaspeirō), "I scatter", "I spread about" and that from διά (dia), "between, through, across" + the verb σπείρω (speirō), "I sow, I scatter". In Ancient Greece the term διασπορά (diaspora) hence meant "scattering" and was inter alia used to refer to citizens of a dominant city-state who emigrated to a conquered land with the purpose of colonization, to assimilate the territory into the empire. An example of a diaspora from classical antiquity is the century-long exile of the Messenians under Spartan rule and the Ageanites as described by Thucydides in his "history of the Peloponnesian wars." So after the Bible's translation into Greek, the word Diaspora would then have been used to refer to the Northern Kingdom exiled between 740-722 BC from Israel by the Assyrians, as well as Jews, Benjaminites, and Levites exiled from the Southern Kingdom in 587 BCE by the Babylonians, and from Roman Judea in 70 CE by the Roman Empire. It subsequently came to be used to refer to the historical movements of the dispersed ethnic population of Israel, to the cultural development of that population or to that population itself. In English when capitalized and without modifiers (that is simply, the Diaspora), the term refers specifically to the Jewish diaspora; when uncapitalized the word diaspora may be used to refer to refugee or immigrant populations of other origins or ethnicities living "away from an established or ancestral homeland". The wider application of diaspora evolved from the Assyrian two-way mass deportation policy of conquered populations to deny future territorial claims on their part. In all cases, the term diaspora carries a sense of displacement the population so described finds itself for whatever reason separated from its national territory, and usually its people have a hope, or at least a desire, to return to their homeland at some point, if the "homeland" still exists in any meaningful sense. Some writers have noted that diaspora may result in a loss of nostalgia for a single home as people "re-root" in a series of meaningful displacements. In this sense, individuals may have multiple homes throughout their diaspora, with different reasons for maintaining some form of attachment to each. Diasporic cultural development often assumes a different course from that of the population in the original place of settlement. Over time, remotely separated communities tend to vary in culture, traditions, language and other factors. The last vestiges of cultural affiliation in a diaspora is often found in community resistance to language change and in maintenance of traditional religious practice. In an article published in 1991, William Safran set out six rules to distinguish diasporas from migrant communities. These included criteria that the group maintains a myth or collective memory of their homeland; they regard their ancestral homeland as their true home, to which they will eventually return; being committed to the restoration or maintenance of that homeland; and they relate "personally or vicariously" to the homeland to a point where it shapes their identity. While Safran's definitions were influenced by the idea of the Jewish diaspora, he recognised the expanding use of the term. In further cases of the use of the term, "the reference to the conceptual homeland – to the 'classical' diasporas – has become more attenuated still, to the point of being lost altogether". Here, Brubaker cites "transethnic and transborder linguistic categories...such as Francophone, Anglophone and Lusophone 'communities'", along with Hindu, Sikh, Buddhist, Confucian, Huguenot, Muslim and Catholic 'diasporas'. Brubaker notes that, as of 2005, there were also academic books or articles on the Dixie, white, liberal, gay, queer and digital diasporas. One of the largest diaspora of modern times is the African Diaspora, which dates back several centuries. During the Atlantic Slave Trade, 9.4 to 12 million people from North, West, West-Central and South-east Africa survived transportation to arrive in the Western Hemisphere as slaves. This population and their descendants were major influences on the culture of English, French, Italian, Portuguese and Spanish New World colonies. Prior to the trans-Atlantic slave trade, millions of Africans had moved and settled as merchants, seamen and slaves in different parts of Asia and Europe. From the 8th through the 19th centuries, an Arab-controlled slave trade dispersed millions of Africans to Asia and the nations in the region of the Indian Ocean. The earliest known Asian diaspora of note is the Jewish diaspora, the majority of which can be attributed to the Roman conquest, expulsion, and enslavement of the Jewish population of Judea, and whose descendants became the Ashkenazim, Sephardim, and Mizrahim of today. Similarly, the Romani trace their origins to the Indian subcontinent, and their presence in Europe is first attested to in the Middle Ages. Chinese emigration (also known as the Chinese Diaspora) first occurred thousands of years ago. The mass emigration that occurred from the 19th century to 1949 was caused mainly by wars and starvation in mainland China, as well as political corruption. Most immigrants were illiterate or poorly educated peasants and coolies (Chinese: 苦力, literally "hard labor"), who immigrated to developing countries in need of labor, such as the Americas, Australia, South Africa, Southeast Asia, Malaya and other places. In Siam, regional power struggles among several kingdoms in the region led to a large diaspora of ethnic Lao between the 1700s-1800s by Siamese rulers to settle large areas of the Siamese kingdom's northeast region, where Lao ethnicity is still a major factor in 2012. During this period, Siam decimated the Lao capital, capturing, torturing and killing the Lao king Anuwongse. From the 1860s, Circassian people were dispersed through the Levant, Europe, North America, Australia, and within historical Circassia in the North Caucasus (in modern-day Russia). European history contains numerous diaspora-like events. In ancient times, the trading and colonising activities of the Greek tribes from the Balkans and Asia Minor spread people of Greek culture, religion and language around the Mediterranean and Black Sea basins, establishing Greek city states in Magna Graecia (Sicily, southern Italy), northern Libya, eastern Spain, the south of France, and the Black Sea coasts. 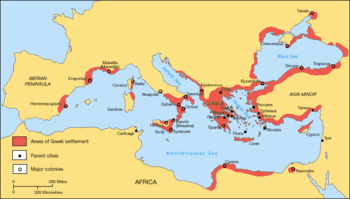 Greeks founded more than 400 colonies. Alexander the Great's conquest of the Achaemenid Empire marked the beginning of the Hellenistic period, which was characterized by a new wave of Greek colonization in Asia and Africa, with Greek ruling classes established in Egypt, southwest Asia and northwest India. Subsequent waves of colonization and migration during the Middle Ages added to the older settlements, or created new ones, thus replenishng the Greek diaspora and making it one of the most long-standing and widespread in the world. The Migration Period relocations, which included several phases, are just one set of many in history. The first phase Migration Period displacement from between CE 300 and 500 included relocation of the Goths (Ostrogoths and Visigoths), Vandals, Franks, various other Germanic people (Burgundians, Lombards, Angles, Saxons, Jutes, Suebi, Alemanni, Varangians and Normans), Alans and numerous Slavic tribes. The second phase, between CE 500 and 900, saw Slavic, Turkic, and other tribes on the move, resettling in Eastern Europe and gradually making it predominantly Slavic, and affecting Anatolia and the Caucasus as the first Turkic tribes (Avars, Huns, Khazars, Pechenegs), as well as Bulgars, and possibly Magyars arrived. The last phase of the migrations saw the coming of the Hungarian Magyars and the Viking expansion out of Scandinavia into Europe, as well as Greenland and Iceland. Such colonizing migrations cannot be considered indefinitely as diasporas; over very long periods, eventually the migrants assimilate into the settled area so completely that it becomes their new homeland. Thus the modern population of Hungary do not feel that they belong in the Western Siberia that the Hungarian Magyars left 12 centuries ago; and the English descendants of the Angles, Saxons and Jutes do not yearn to reoccupy the plains of Northwest Germany. In 1492, a Spanish expedition headed by Christopher Columbus arrived in the Americas, after which European exploration and colonization rapidly expanded. Historian James Axtell estimates that 240,000 people left Europe for the Americas in the 16th century. Immigration continued. In the 19th century alone over 50 million Europeans migrated to North and South America. 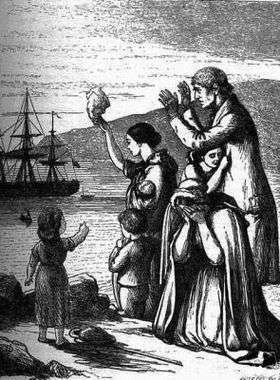 A specific 19th-century example is the Irish diaspora, beginning in the mid-19th century and brought about by An Gorta Mór or "The Great Hunger" of the Irish Famine. Estimates are that between 45% and 85% of Ireland's population emigrated, to countries including Britain, the United States, Canada, Argentina, Australia and New Zealand. The size of the diaspora is demonstrated by the number of people around the world who claim Irish ancestry; some sources put the figure at 80-100 million. In the United States, approximately 4.3 million people moved outside their home states in 2010, according to IRS tax exemption data. In a 2011 TEDx presentation, Detroit native Garlin Gilchrist referenced the formation of distinct "Detroit diaspora" communities in Seattle and Washington, D.C., while layoffs in the auto industry also led to substantial blue-collar migration from Michigan to Wyoming in the mid 2000s. In response to a statewide exodus of talent, the State of Michigan continues to host "MichAGAIN" career recruiting events in places throughout the United States with significant Michigan diaspora populations. In Mainland China, millions of migrant workers have sought greater opportunity in the country's booming coastal metropolises, though this trend has slowed with the further development of China's interior. Migrant social structures in these Chinese mega-cities are often based on place of origin, such as a shared hometown or province, and it is common for recruiters and foremen to select entire work crews from the same village. In two separate June 2011 incidents, Sichuanese migrant workers organized violent protests against alleged police misconduct and migrant labor abuse near the southern manufacturing hub of Guangzhou. Following World War II, the creation of the state of Israel, and a series of uprisings against colonialist rule, the Middle East nations became more hostile in relation to their historic Jewish populations, sepharadim and mizrahiml, of nearly 1 million people. Most of them emigrated, with the majority resettling in Israel. At the same time, the Palestinian diaspora resulted from Israel's creation in 1948, in which 750,000 people were expelled or fled from their homes. The diaspora was enlarged by the effects of the 1967 Arab-Israeli War. Many Palestinians continue to live in refugee camps maintained by Middle Eastern nations, but others have resettled in the Middle East and other countries. The Assyrian diaspora expanded by the Civil War in Lebanon, the coming into power of the Islamic republic of Iran, the Ba'athist dictatorship in Iraq, and the present-day unrest in Iraq pushed Assyrians on the roads of exile. A million Colombian refugees have left Colombia since 1965 to escape the country's violence and civil wars. In South America, thousands of Argentinan, Chilean and Uruguayan refugees fled to Europe during periods of military rule in the 1970s and 1980s. In Central America, Nicaraguans, Salvadorans, Guatemalans, Hondurans, Costa Ricans (however, the country had no dictators) and Panamanians fled conflict and poor economic conditions. Following the Iraq War, nearly 3 million Iraqis had been displaced as of 2011, with 1.3 million within the Iraq and 1.6 million in neighboring countries, mainly Jordan and Syria. The Syrian Civil War has forced further migration, with at least 4 million displaced as per UN estimates. 1 2 3 "Diaspora". Merriam Webster. Retrieved 22 February 2011. 1 2 3 Melvin Ember, Carol R. Ember and Ian Skoggard, ed. (2004). Encyclopedia of Diasporas: Immigrant and Refugee Cultures Around the World. Volume I: Overviews and Topics; Volume II: Diaspora Communities. ISBN 978-0-306-48321-9. ↑ Rozen, Mina (2008). Homelands and Diasporas: Greeks, Jews and Their Migrations (International Library of Migration Studies). London, England: I. B. Tauris. ISBN 1845116429. ↑ "diaspora, n.". Oxford English Dictionary Online. November 2010. Retrieved 22 February 2011. ↑ Brubaker 2005, p. 5. 1 2 Weinar 2010, p. 75. ↑ Cohen 2008, p. 6. ↑ Cohen 2008, p. 4. ↑ Brubaker 2005, p. 3. 1 2 Brubaker 2005, p. 14. 1 2 Brubaker 2005, p. 2. ↑ Brubaker 2005, pp. 2–3. ↑ Kennedy, Bruce (31 August 2010). "The Economic Impact of the 'Katrina Diaspora'". Daily Finance. Retrieved 23 February 2011. ↑ Walden, Will (1 September 2005). "Katrina scatters a grim diaspora". BBC News. Retrieved 23 February 2011. ↑ McAlister, Elizabeth. "Listening for Geographies". Routledge. Retrieved 5 November 2012. ↑ Burns, William (9 December 2013). "The Potential of Science Diasporas". Science & Diplomacy. 2 (4). ↑ Tölölyan, Khachig (December 1996). "Rethinking Diaspora(s): Stateless Power in the Transnational Moment". Diaspora: A Journal of Transnational Studies. 3 (36). ↑ ""Welcome to Encyclopædia Britannica's Guide to Black History", ''Encyclopædia Britannica''". Britannica.com. Retrieved 5 January 2014. ↑ Weheliye, Alexander (2009). Black Europe and the African Diaspora. p. 162. ISBN 9780252076572. ↑ Josephus War of the Jews 9:2. ↑ Kenrick, Donald (2007). Historical Dictionary of the Gypsies (Romanies) (2nd ed.). Scarecrow Press. p. xxxvii. 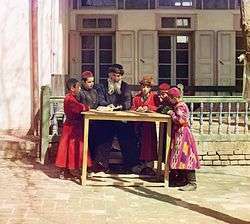 The Gypsies, or Romt it is generally accepted that they did emigrate from northern India some time between the 6th and 11th centuries, then crosanies, are an ethnic group that arrived in Europe around the 14th century. Scholars argue about when and how they left India, bused the Middle East and came into Europe. ↑ Kalaydjieva, Luba; Gresham, D; Calafell, F (2001). "Genetic studies of the Roma (Gypsies): A review". BMC Medical Genetics. 2: 5. doi:10.1186/1471-2350-2-5. PMC 31389 . PMID 11299048. Retrieved 16 June 2008. ↑ Ma, Laurence J. C.; Cartier, Carolyn L. (2003). The Chinese diaspora: space, place, mobility, and identity. ISBN 978-0-7425-1756-1. ↑ Bhaumik, Subir (7 November 2007). "Bhutan refugees are 'intimidated'". BBC News. Retrieved 25 April 2008. ↑ "Early development of Greek society". Highered.mcgraw-hill.com. Retrieved 5 January 2014. ↑ Axtell, James (September–October 1991). "The Columbian Mosaic in Colonial America". Humanities. 12 (5): 12–18. JSTOR 4636419. Archived from the original on 19 November 2009. ↑ Eltis, Kingston David (1987). Economic Growth and the Ending of the Transatlantic Slave Trade. Oxford University Press. p. 139. ISBN 978-0-19-536481-1. ↑ Bruner, Jon (16 November 2011). "Migration in America". Forbes. Retrieved 30 September 2013. ↑ Gilchrist, Garlin (6 August 2011). "From Detroit. To Detroit". TEDxLansing. TED. Retrieved 30 September 2013. ↑ Silke Carty, Sharon (5 December 2006). "Wyoming wins over Michigan job seekers". USA Today. Retrieved 30 September 2013. ↑ Walsh, Tom (10 April 2011). "MichAgain program aims to return talented people, investments to Michigan". Detroit Free Press. Retrieved 1 October 2013. ↑ Kenneth, Rapoza (19 February 2013). "Chinese Migrant Workers Enticed To Stay Home". Forbes. Retrieved 1 October 2013. ↑ "China's migrant workers". Wildcat. Winter 2007/08 (80). Retrieved 1 October 2013. ↑ Demick, Barbara (13 June 2011). "China tries to restore order after migrant riots". Los Angeles Times. Retrieved 3 October 2013. ↑ "An International Conference on the Baltic Archives Abroad". Kirmus.ee. Retrieved 5 January 2014. ↑ "1959: The Cuban Revolution". Upfront: The Newsmagazine for Teens. Scholastic. ↑ Sengupta, Kim (16 December 2011). "Will Iraq's 1.3 million refugees ever be able to go home?". The Independent. London. ↑ (UNHCR), United Nations High Commissioner for Refugees. "UNHCR Syria Regional Refugee Response". Retrieved 15 September 2015. 1 2 Olivares, Francisco (13 September 2014). "Best and brightest for export". El Universal. Retrieved 24 September 2014. ↑ "Hugo Chavez is Scaring Away Talent". Newsweek. 30 June 2009. Retrieved 24 September 2014. ↑ "La emigración venezolana a diferencia de otras "se va con un diploma bajo el brazo"". El Impulso. 17 December 2014. Retrieved 21 December 2014. ↑ Van Den Bos, Matthijs; Nell, Liza (2006). "Territorial bounds to virtual space: transnational online and offline networks of Iranian and Turkish–Kurdish immigrants in the Netherlands" (PDF). Global Networks: A Journal of Transnational Affairs. 6 (2): 201–220. doi:10.1111/j.1471-0374.2006.00141.x. Retrieved 30 September 2013. ↑ Chester, Ken (7 August 2013). "How WeChat And Zalo Shine a Light On The Asian American Diaspora". Tech in Asia. Retrieved 30 September 2013. ↑ "The Globe: Diaspora Marketing, Nirmalya Kumar and Jan-Benedict Steenkamp". Harvard Business Review. October 2013. ↑ Peterson-de la Cueva, Lisa (24 November 2008). "Gran Torino connects Hmong Minnesotans with Hollywood". Twin Cities Daily Planet. Retrieved 30 September 2013. Weinar, Agnieszka (2010). "Instrumentalising diasporas for development: International and European policy discourses". In Bauböck, Rainer; Faist, Thomas. Diaspora and Transnationalism: Concepts, Theories and Methods. Amsterdam: Amsterdam University Press. pp. 73–89. ISBN 90-8964-238-2.